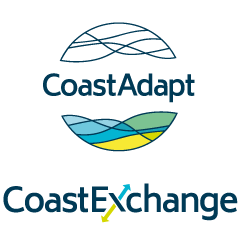 Australian coastal zones are likely to experience the full range of direct and indirect climate change impacts. Australian coastal zones are likely to experience widespread impacts from climate change and sea-level rise. Some impacts are specific to coastal areas. For example, rising sea levels combined with storm surge is likely to cause accelerated erosion and increased risk of inundation. For settlements and infrastructure this is likely to result in damage to and loss of infrastructure. For ecosystems, sea level rise may lead to loss of habitat, and salinization of soils may cause changes to the distribution of plants and animals. Some impacts are more general. More intense rainfall will increase flood risk. Increased temperatures will cause more heatwaves, with impacts on human and ecosystem health, with increased risk of poor health and even death of people, animals and plants. Incremental warming of the ocean will affect ecosystems such as coral reefs. Increased emissions of CO2 to the atmosphere are partly absorbed by oceans, increasing the acidity of ocean waters and changing the physiology of marine organisms. Australian coastal zones are likely to experience the full range of impacts from climate change and sea level rise (Figure 1). With over 80 % of the population living near the coast, this is likely to cause significant economic and social costs to Australia (see Impacts: coastal communities). Rising sea levels together with storm surge are likely to cause inundation and accelerated erosion of many beaches around the Australian coastline. While we tend to think of sea-level rise changing slowly—making the major impacts of sea-level rise in the long-term future— there is a more imminent risk from short-term extreme storms. When higher seas (as a result of sea-level rise) combine with strong winds and wave action, there is an increased risk of inundation. Both flooding and erosion will impact on housing and infrastructure close to the coast and it is anticipated that some properties will be damaged or even become uninhabitable (see Impacts: settlement and infrastructure). With 50 cm of sea-level rise, inundation events that previously occurred once every 100 years could happen much more frequently, in some locations as much as once a year. The estimated replacement cost of residential buildings at risk of flooding under 1.1 m sea-level rise is as much as $63 billion (Department of Climate Change 2009). In addition, sea-level rise threatens other economically significant industries and infrastructure including ports, the fishing and seafood industries and tourism. Additionally flooding from increased sea level will have very serious impacts in estuaries, rivers, lakes and lagoons with significant costs to biodiversity and the landscapes. An additional flood risk can also come from inland floodwaters as a result of more intense rainfall events. The flow of freshwater into estuarine and coastal habitats is important to sustain life. These flows bring nutrients that are essential for coastal productivity but can also lead to poor water quality (due to soil particles and fertilizers). Factors such as sea-level rise and changes to rainfall regimes (more frequent drought) can increase salinity in these habitats and affect the viability of the existing plant and animal communities (see Impacts: freshwater biodiversity). Increased salinity will push mangrove distribution further inland, but only if there is available habitat that can be colonised. However often urbanisation prevents this migration (see Impacts: ecosystems). The overall impacts of climate change on the water cycle (i.e. changes in rainfall, temperature, sea levels) can put water security in both urban (see Impacts: coastal waste water management) and agricultural sectors (see Impacts: coastal agriculture) at risk. Increased emissions of CO2 to the atmosphere are partly absorbed by oceans. This has had the benefit of slowing climate change, but has also changed the chemistry of ocean waters, increasing the acidity that in turn has negative impacts on marine organisms (see Ocean acidification). Coastal industries (shellfish aquaculture, tourism) may in turn experience economic losses as populations of marine organisms are impacted. Increasing temperatures have several implications for coastal areas. An immediate physical change is warming sea surface temperatures, which can result in more frequent algal blooms and coral bleaching. Sea surface temperatures are known to drive the development of cyclones and storms such as East Coast Lows. Some studies suggest that there will be an increase in the intensity of cyclones, and that they could track further south, although the total frequency of cyclones (and East Coast Lows) may in fact decrease (see information on Cyclones and ECLs). Increasing temperatures will also affect people living in coastal areas. Excessive heat or heat waves are of particular concern, with extreme heat known to be the leading cause of death from climate related events in Australia (see Impacts: Human health). The ways we design our housing and cool our houses are likely to change and this has implications for electricity supply and demand. Excess temperatures also impact the health and wellbeing of flora and fauna and both gradual changes in temperature and extreme heat are likely to drive changes in the composition of biodiversity and primary production. Figure 1: Impacts of climate change on coastal areas. Source: Image created courtesy of the Integration and Application Network, University of Maryland Center for Environmental Science (ian.umces.edu/symbols/). Department of Climate Change, 2009: Climate change risks to Australia's coast: a first pass national assessment. Australia Government, Canberra. pp. 172. Accessed 14 June 2016. [Available online at http://www.environment.gov.au/system/files/resources/fa553e97-2ead-47bb-ac80-c12adffea944/files/cc-risks-full-report.pdf].